These small steppers are a great way to get things moving, especially when positioning and repeatability is a concern. When using a current limiting driver such as the Easydriver or Big Easydriver, a 12 volt power supply can be used as long as you adjust the current level to 400mA or less. If using a non current limited driver (like a L293D or an H-bridge) you will need to lower your input voltage to keep the motor current below 400mA. This is a Bipolar motor. Looks like the maximum stepper motor speed is about 997-999 RPM if you use it with an Arduino microcontroller and the EasyDriver. Check here for the example code that was used to test the stepper motor. The number of steps for a full revolution looks to be about 384 microsteps since the stepper motor with cable has a step angle of 7.5 degrees (…360/7.5 = 48 step stepper ) and the EasyDriver has a range of 8 microsteps for a full step. Is this a geared motor? Would be useful to include so anyone looking for that info can find it. If the resistance is 4ohms/coil, should it be 3A/coil? I=V/R, 3=12/4, assuming 12V.... I find this to be supported by how much current I'm seeing being drawn without current limiting. I'm finding this to be true. I'm using a 1A H-Bridge and it is getting REALLY hot, in well under 10s of idle. SparkFun really needs to review this and test their products! All it is really doing is help them sell their own motor driver or fry these motors, which is not fair to the customer. Could I use this motor to generate electricity? I'm too late, but yes. You can email SFE tech support and they can help. Trying to get this motor to work with a "L293D Motor Drive Shield" the shield is capable of handling 600mA per coil, this motor according to the data here takes 400mA (presumable per coil) so should be good there. However the data sheet here does not relay explain the pin outs only coil A and coil B but not which wires are which coil, the truth table is also a bit confusing, I am a programmer and i cant read it. i tried to do my own truth table and it seems to confirm my guess that yellow and orange is one coil, and brown and black is another coil,. however I am also showing connectivity/resistance between orange and brown,.. that should not happen correct? Running off of fully charged 11.1v 500mAh (10C) lipo pack w/Arduino USB powered, Power jumper from Arduino disconnected. I'm having the same issue here. It looks like the motor can't be run with the L293. I'm trying to use it with adafruit's motor shield and I get the same results - overheating and unreliability. Here is the link to my post and the answer I got. Did anyone manage to get this motor working with an L293? Maybe it needs some extra protection, resistors...? I'm about 9 months to late but a stepper motor is to slow for lift (if that's what ur using it for). 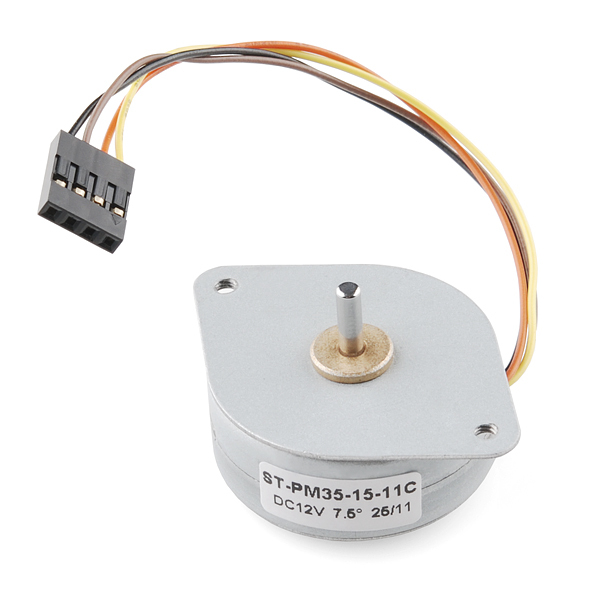 usually you need a normal drushed dc motor or a 3 phade brushless motor for that kind of power to weight ratio. If your going to use a motor as some sort of flight control. I would recommend a servo because its lighter and you would not need a flap to move more than 360Âº. I was planning on using it for a camera gimbal, but eventually decided that a brushless motor would work better. Thanks! Hello! For an art project, I need to control 20 of these motor. Wich Arduino card can manage that? Do I need one EasyDriver per motor? Any interesting URL for me? Thanks a lot by advance!! Hi! I would recommend you look at the Quadstepper Motor Driver Board, which can drive up to 4 stepper motors at a time. This should simplify your set up for you. If you have additional questions about your project, contact us at techsupport @ sparkfun dot com and we can give you some other suggestions. any hardware parts to be compatible? Like axles, bolts, wheels, pulleys, belts? and such.. ? Similar question: what should I use to connect this motor to a winch drum? Hi, anybody has the weight information for this stepper? Thanks a lot. Would pairing this with the mechanum wheels be appropriate, or does it need gearing down? Hi, does anyone have the wiring instructions and a sample code to run this stepper from a PICAXE? How can this be mounted to anything? I can't find the screw thread details, and I'm not sure where to look for brackets that would fit it. Datasheet says it has two M3 holes for mounting. I bought four of these. Like others on this list, I did not realise how difficult it would be to attach a pulley or gears to this. 3mm drive shafts do not seem to be very common. Please, if you know how to attach gears or pulleys to this motor, please share. Pardon my noob question but I just received this in the mail and the shaft isn't threaded or notched; how do you attach anything to the shaft? Could someone tell me the speed of this motor in RPM? Also I'm looking in to using this for a hovercraft project and would like to know the weight as the hovercraft would only be able to pick so much up. The RPM depends on how you're driving it, and could be above 10,000 RPM with the right driver. But I wouldn't recommend using this for a propeller. Stepper motors are built for precise positioning. What you want is pure speed and power. 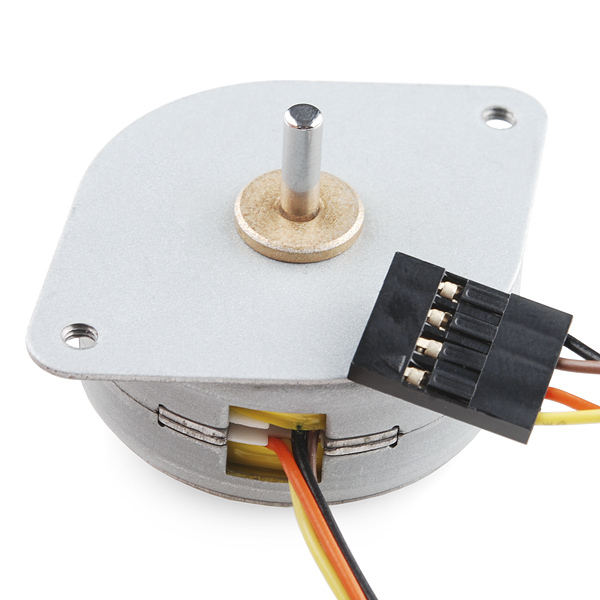 You might take a look at the brushed or brushless motors used by RC aircraft, sold by HobbyKing.com and others. Where can we get gears, racks and pinions, etc. for this motor? I'm a complete newbie so don't hate me if my question is stupid. :) Are these strong enough to turn a potentiometer? Or is extra gearing required? I'm trying a simple experiment to demonstrate hydroelectric power which I found on treehugger.com. 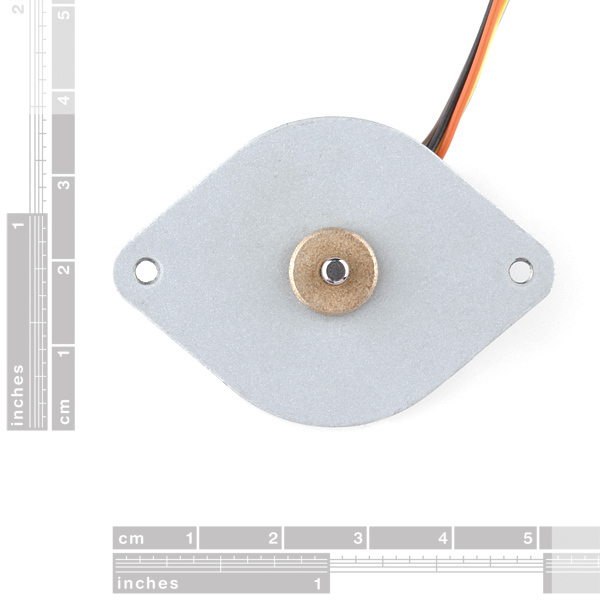 One of the things required is a stepper motor, preferably 12V or less. Would this model be the right one? If so, how should I connect it(given that it has 4 wires instead of 3/2)? All stepper motors will have four leads or more; you can certainly use them as generators, but since the output will be AC, you'll need to add diodes (rectifiers) on the output wires if you want DC (diagram here). You can also use a brushed motor such as this one as a generator; this tends to be simpler as there are only two wires and the output will be DC all by itself, but you'll need to spin it pretty fast to get usable voltage (which may not matter for your experiment). Hello! I would like to control two of these motors with two EasyDriver. Could somebody recommend a power supply? I thought about this one(https://www.sparkfun.com/products/9442) is 12V and 600mA. Would it be strong enough? Thanks in advance! 2 questions. Is this powerful enough to run a 3D printer or CNC? And, why is a photocell in the related products? How many steps are there per revolution, I didn't see it on the data sheet. First time doing any electronics, how do the pins come out of that plastic connector so I can hook it up to the EasyDriver via breadbiard? Has anyone tried to feeding this baby with a LiPo battery? Anyone know the mass of this motor? Thanks! What is the RPM of this motor? "but can't seem to figure out which of the wires in the motor cable match with which MOTOR pin on the EasyDriver board.". Use multimeter to measure the resistance between motor leads. Between two of them it shows few ohms, between another two it should show about the same value. Connect one pair to "A" and another to "B" in stepper card, if motor does not step switch A and B. Thanks very much for the info. I managed to figure it out through trial and error (and a replacement EasyDriver board), but in the future I'll use your method. I'm new to the electronics game, so forgive me if the answer to this is obvious. I am trying to hook up one of these motors to the EasyDriver Stepper Motor Driver but can't seem to figure out which of the wires in the motor cable match with which MOTOR pin on the EasyDriver board. I've checked out the datasheet, but that doesn't appear to be any help. The Datasheet link is broken. Is g/cm is a unit of torque? Torque is force unit x distance not mass / distance. It's technically correct. They normally mean gram-force (newton equivalent of what 1 gram of mass exhibits in a 1G environment). Silly, but many motor manufacturers specify torque this way. They never actually TELL you this, though. I believe he's partially correct in that it should be g-f*cm (as its given in the data sheet) and not g-f/cm as shown on the page. I posted a similar review on the dual motor control (Dual TB6612FNG with Headers) page. Someone should mention (Me maybe?) that this is also a great stepper for 3 volt systems.While this motor description might lead you believe that it is a 12 volt motor, its 4 ohm coils can be driven to full current (thus full torque) by as little as 1.6 volts. What you give up at low voltage is high speed. Its 3.5 Henry inductance results in a time constant of around 800 msec. If you donât need full torque, the motor will work at less than 400 ma. which can reduce the current buildup time. I have one on my desk right now nicely driving a clock hand at less than 100 ma. peak. For applications like driving clocks or solar trackers which require slow single stepping, this is a small, relatively inexpensive, and high torque alternative to the Lavet drives found in clock motors (and is also reversible). In particular this motor is very well matched to the Sparkfun motor driver, Dual TB6612FNG , Thatâs where the low Vcc of the dual motor control makes it perfect. Its PWM feature helps provide energy efficient current limiting if you are running on a 3 V battery. Performs just as expected, even though I use a 9 volt supply. Plug and play with an Arduino Adafruit V1.2 motor shield. I purchased a pair of these for possible use to power the 2 wheels of a small robot. The small shaft without flats would make it more difficult to connect to robot wheels than the shafts with flats as on small DC robot motors or the unipolar 28BYJ-48. The robots I'm making require very precise and reproducible movements, so stepper motors are required. There are now unipolar motor drivers circuits that require only 3 output pins to control both motors (rather than 8 pins with 2 H-bridges) so 28BYJ-48's work fine, have shafts with flats and are very cheap. Nice little motor. Easy to hook up and control using an Easy Driver board and a dev board. For lightweight applications without a lot of torque required these are great - especially at the price. Definitely recommend! I needed a small inexpensive stepper motor to control. I had been trying to use some 28BYJ-48 but they were too slow etc. I went searching for steppers and was tempted by some of the NEMA 17s but then stumbled on these at SparkFun. Right price and a nice compact size. Slapped a Pololu stepper driver on with 12v supply and the arduino/ATTINY 85 was happy pulsing away. The setup has been running continuously for 8 days now. It is a little warm but nothing alarming and is chugging away no problems. The next challenge is how to mount stuff to shaft which is 3mm and smooth.